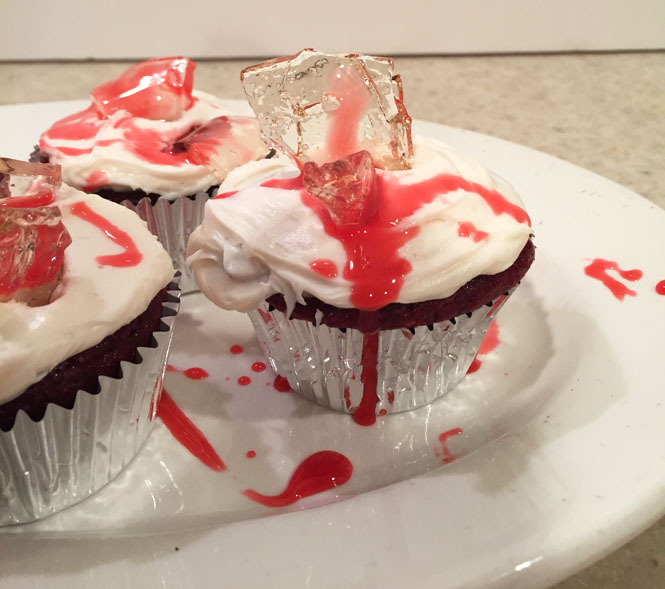 These cupcakes definitely require your undivided attention, but making bloody glass cupcakes is perfect for many occasions - especially Halloween! 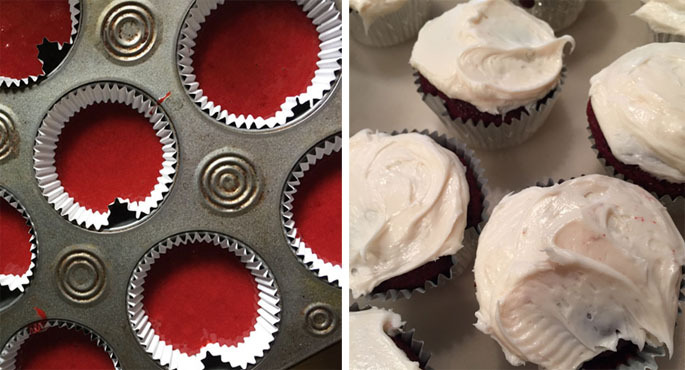 Making the cupcakes is of course the simplest part; I choose to use red velvet cake with cream cheese frosting just to throw an extra shade of red into the mix, but this is totally your choice. Once the cupcakes are done and frosted, I recommend putting them into the fridge for a little bit to get them cold and ready for the glass shards (also optional). 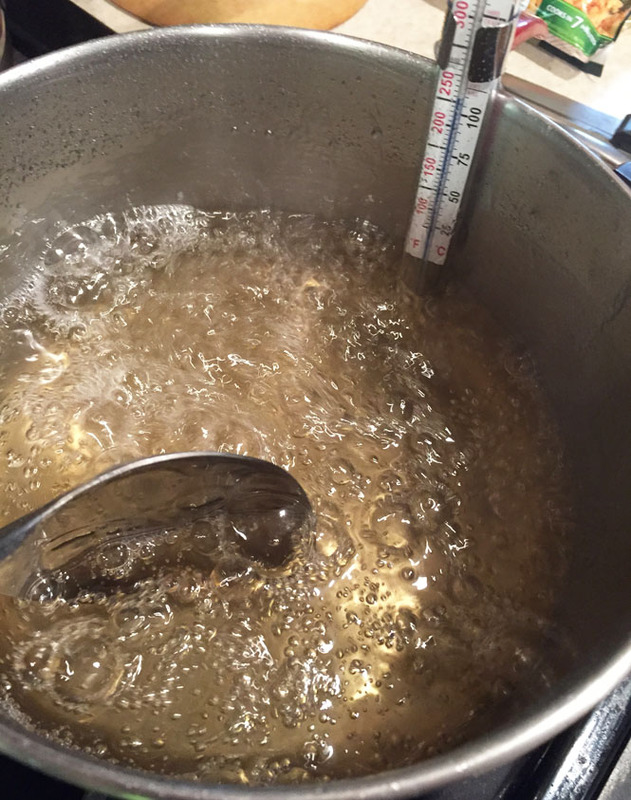 Place stove on medium-high and place a candy thermometer on the side of the pot to measure the temperature. Bring the mix to a boil (this takes a LONG time - the most time consuming part. I waited a good 15 minutes before I saw any bubbles at all) and let boil until the candy thermometer is at 300 degrees, which is also considered hard ball. 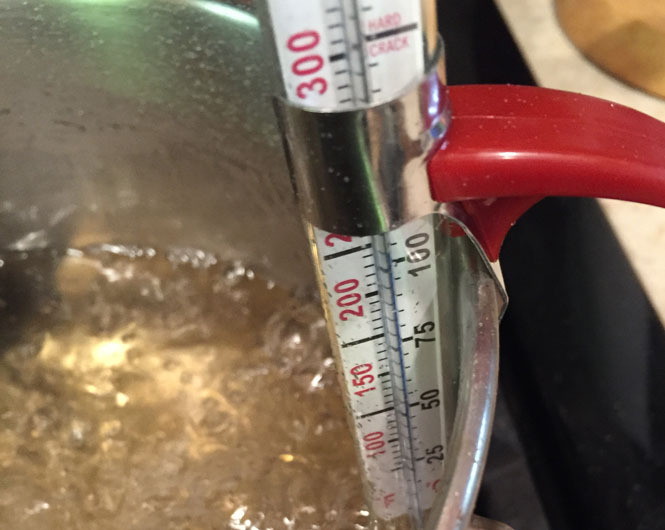 All candy thermometers are different and I swore I was doing this wrong at first, but don't worry because it does take a while to get to 300 degrees! Stir the mixture constantly before, during and as it boils to prevent it from hardening. As the water in the mix begins to evaporate, it'll thicken more and more (this is a good thing, but don't let it get too thick, by mixing non stop!). Have a baking sheet lined with either wax paper or tin foil ready near your stove. Once the mix reaches hard ball/300 degrees, quickly pour the mix onto the baking sheet. Place it in the fridge to cool completely. If you're in a bit of a time crunch, you can try what I did the second time around; after letting the mixture cool for at least an hour, try placing the baking sheet(s) into the freezer for 5-10 minutes at a time and then back into the fridge. When I originally made this, I made the sugar glass sort of in a rush and I only let the mixture cool in the fridge for 2 hours... When I took the mix out, it was still sort of gooey and not completely hardened. Having the mix not 100% hardened will make it super hard to break up (and will melt quickly) once you get to that step! Just by feeling the "glass", you'll be able to tell if its hard enough or not. If you have the time, place the baking sheet into the freezer for the last 20 or so minutes before you're going to use it to help harden it as much as possible. Take a rubber mallet and smash the glass into shards. The more you smash, the smaller and sharper the pieces will get. I wanted some small and some bigger pieces, so I smashed a little more than half and then cut the rest of the pieces smaller with a razor blade as needed. P.S. if you are able to let the glass sit in the baking tray to cool overnight, it will be easier to cut. But switching between the fridge and freezer for as long (4 ish hours) as possible will make SUCH a difference in these too - seriously, I wish I had a picture of these from the first one that I tried to make. Disaster, ha! If you look closely here, you can see that the temperature was only just hitting 250 degrees... also the point of which I started to think I was 1. going crazy and 2. doing something wrong! 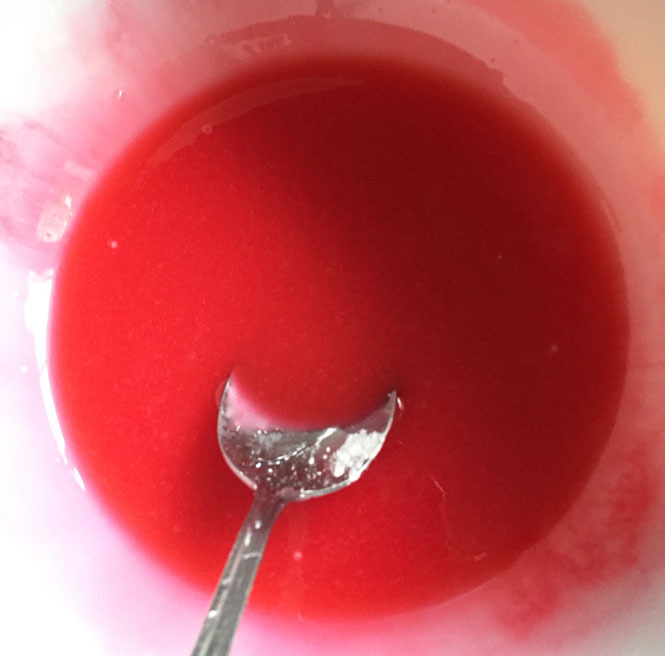 There's a couple different ways you can make edible blood, but I tend to be a perfectionist, especially once I have a vision of something in my head! For this "blood", I was super specific at how many drops of food coloring I used to get the perfect shade of red. This is about 5 drops, but you can adjust as you see fit while you're making it. First, add red food coloring (approx. 12 drops) and blue drops as needed. I found that 12 drops of red, 3 drops of blue, mix it, and then 2-4 more drops of red works best. Mix it until it thickens and add the chocolate syrup if necessary/desired. You may not need it, but a little bit (not too much or it'll turn brown!) does help the thickness. 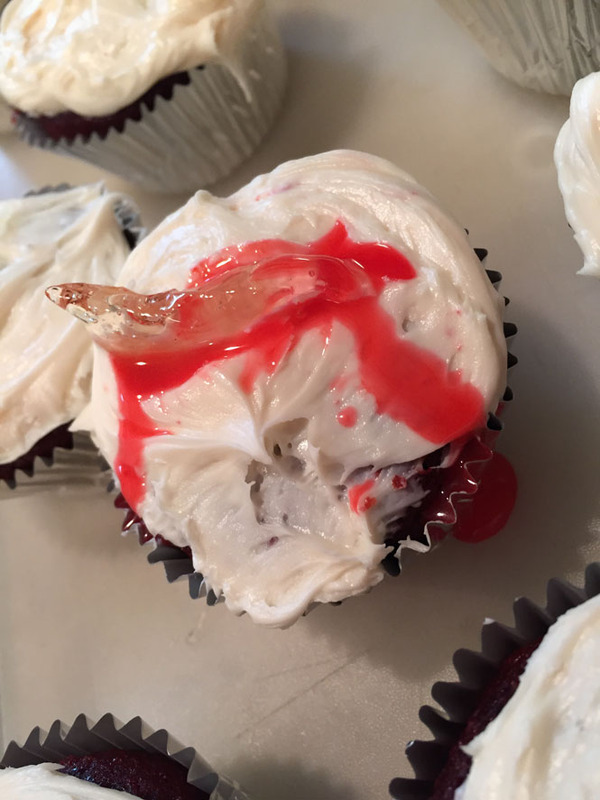 After the glass shards are in the cupcakes, drizzle the edible blood on each cupcake. 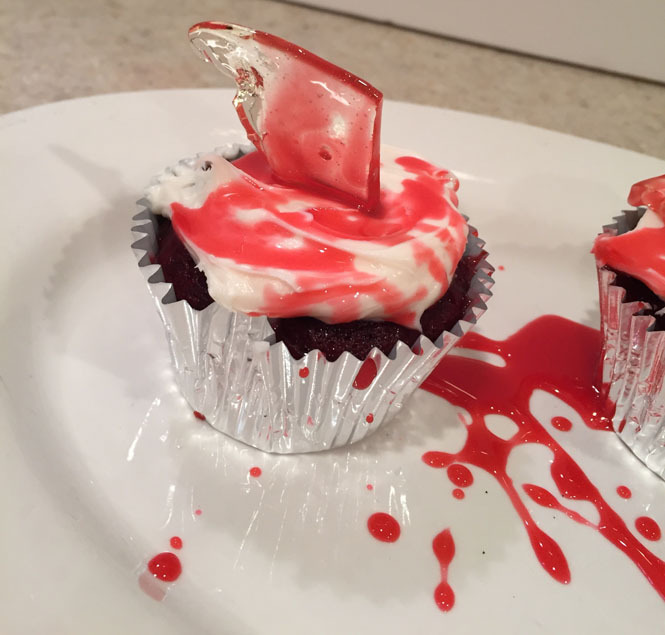 I prefered a bit of a messy, bloody look so I drizzled it atop all of the cupcakes at once rather than meticulously dribbling blood onto each cupcake. Voila! 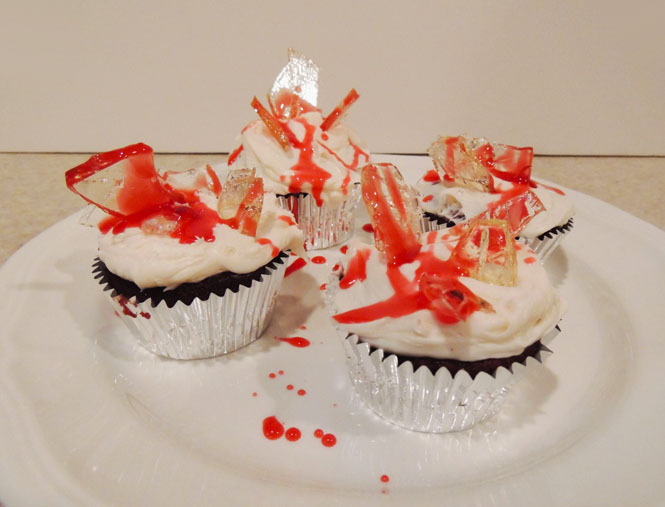 You now have bloody, broken glass cupcakes! Aren't these so cool?! I love making them and I'm glad I attempted to make them more than once - it definitely can take a while to perfect these! I know there have been tutorials on making sugar glass before, but I never found them fully helpful since I hadn't seen a full explanation about the time constraint you have with getting the glass to perfection - so I hope that this is helpful!! What are you doing for Halloween? Are these something you think you'll try? I'd love to hear how they come out! These are the CUTEST! Such a neat Halloween cupcake idea. Thanks so much for sharing! Wow! These are awesome! Making the glass looks pretty hard, but I love the end result. By far the coolest cupcakes I've ever seen! Ohhhhh my gosh, you are the coolest ever!! I love that you also made these for Pretty Little Liars. These are super cute and such a clever idea. I'm going to pin this so I have it for next year's Halloween! Those look so cute! It's been awhile since I made candy to the hard boil stage. I always either overcook or undercook! Those cupcakes are so cute!You make it look so easy, I would like to try making this. I cannot get over how cool these look! I bet they were perfect for Halloween. The "glass" just looks so realistic. Pretty sure these would send the kids into peals of laughter. I have to send this to my BIL he'd love it. What a fun treat! Bloody yummy it looks like! I will have to try these for next Halloween! These are so cool! Omg these look so yum! I wish I was better at baking! 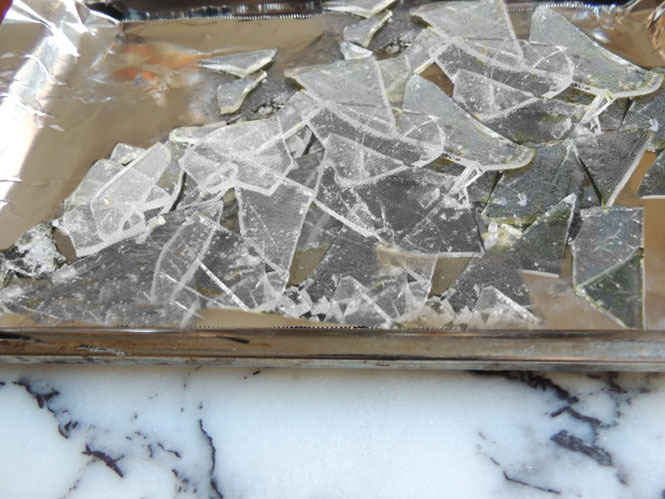 Oh wow, that visual is so cool because it really does look like broken glass. What a creative way to serve a Halloween cupcake. Nice recipe.I tried this recipe as it turned out to be very delicious. Thanks for sharing such an amazing and interesting recipe. Pretty sure these would send the kids into peals of laughter. I have to send this to my BIL he'd love it. I wish I was better at baking!